Richard Jacobson is an artist, video blogger, and former pastor. His upcoming book, Unchurching: Escaping Churchianty and Pursuing Spiritual Community, sets out to inspire believers who are captivated by the church but disillusioned by the contemporary church model. Richard, his wife, and their three children live near Nashville, Tennessee. There are times when God sends us down a path we wouldn’t have chosen, yet it serves to teach (and often bless) us more than our original plan. Have you ever experienced such a “Divine Detour”? As strange as it may sound, becoming a pastor was a divine detour for me. My initial church experience began on the far opposite end of the spectrum from organized church. I was raised in the Jesus Movement. I even lived in a Christian commune for awhile. Because God has a weird sense of humor, I eventually ended up becoming a pastor in an organized church. But even going into it, I knew it was only for a season. Eventually, I left to go in search of church community that looks more like the churches we read about in the Bible. Although, to be fair, I still think I’m a pastor. As I’m sure you’ll soon discover, I don’t think churches were ever meant to become organizations and I don’t think a pastor is really a position; I think the church is a spiritual family and a pastor is a spiritual parent. Therefore, I still consider myself a pastor even though my season of working in an organized church is long over. And I absolutely feel blessed for having had that whole experience because it helps me speak with authority about the organized church. 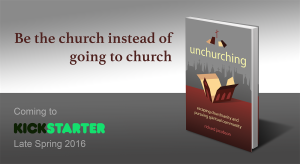 Let’s talk about your upcoming Kickstarter project, a book entitled Unchurching: Escaping Churchianity and Pursuing Spiritual Community. Please tell us a bit about it. The book is about two very different forms of church: the type of churches we read about in the Bible and the type of church model we employ today. The first churches were small Christian communities that functioned like extended spiritual families. Today’s churches are, legally speaking, corporations. The first two parts of the book endeavor to paint a picture of the early church, based solely on what the Bible says, without filtering the text through the lens of today’s organized churches. I think readers will be blown away by how simple church community was originally intended to be. I expect it will instantly feel like home and stir up a longing to become part of such a community, even if they’ve never experienced church like this before. The next part of the book contrasts this picture with today’s church model: the corporation. I’m surprised this topic hasn’t been explored in more detail before. I think it’s going to be quite a shock for believers who have never considered what it means to legally incorporate the Body of Christ into a corporation. The final part of the book ends with what I hope will be a truly inspiring vision of church “outside the box” so to speak. I plan to launch the book on Kickstarter in late Spring or early Summer and plan to have free samples available for download before that. There are a few more details about it on my animated video and cartoon blog, Church Anarchist. Simply go here to learn more. And also check out some of my animations while you’re there! In a single sentence, what do you most hope readers will take away from the book? I hope it emboldens believers who want to pursue genuine church community and convinces them not to settle for church-as-usual. I hope all believers will be encouraged by this book, including those who are quite happy with the organized church and wish to remain in it. But I especially have a heart for anyone who has been mislabeled as a rebel or troublemaker simply because they have legitimate questions about the disconnect between the churches we read about in the Bible and the churches we attend on Sunday mornings. I’m not saying there aren’t actual rebels and troublemakers who might gravitate towards this book and try to misuse it as a prooftext for their own bad attitudes. But I’m not concerned with them. My heart is for devout followers who have a growing conviction that something just isn’t right about the way we do church today. I want them to realize they’re not crazy and they’re not alone. I would pursue becoming a full-time author, artist, and speaker. I feel like I have more ideas than there are sands left in the hourglass and I don’t want to take a bunch of woulda-coulda-shouldas with me to the grave. I want to get as much out as possible: onto the page, onto the screen, in front of live audiences, whatever. Stories and parables are an integral part of both the Old and New Testaments. Is there a Bible story, parable, or passage that has been particularly important to you and/or describes your personal journey of faith? In my late teens and very early twenties, I actually lived the story of the prodigal son. I ran from God pretty hard and tested the limits of His love, only to find out firsthand that His love is limitless. As much as I’d like to say the mythical warrior, my wife has always told me she thinks of me as a mad scientist. Hopefully, it’s simply because I’m always working on some crazy project and coming up with some new idea. But it’s probably best not to question it. We have a tiny little Pomeranian, almost Toy Pomeranian sized, named Ripley. Yep, I named her after Sigourney Weaver’s character in the Alien movies. And we have a cat named… wait for it… Puma Thurman. There’s your readers’ payoff for reading this interview! Thank you, Richard! It’s great to have you as a guest at DivineDetour. 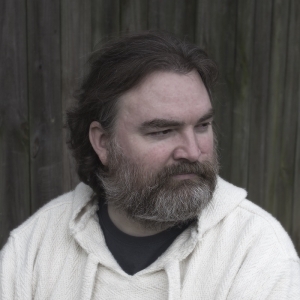 For more information about Richard, visit his website or video blog and follow him on Twitter. Click here to learn more about his Kickstarter project, Unchurching. Nice to meet a fellow writer. Thanks for stopping by! Hey Steve, thanks for the shoutout. 🙂 Hope your book is doing well! Interesting that a book on this subject will still use the corporate marketing structure to get its message out. Kickstarter to boot! David, I appreciate your comment, and I’m sure Richard will want to respond to it. Thank you for your work on behalf of the Gospel. Hey David, it’s Richard Jacobson, the guy from the article. Thanks for the comment. Yes, I’m a big fan of Kickstarter. I think it’s probably a great structure for self-publishing, though this will be my first foray into that world.